Pick n Pay Taste of Cape Town in association with Orbit Sugarfree Chewing Gum celebrates its 5th birthday in Cape Town with fun, food and fabulosity galore. Your tastebuds will be treated to a 5-star experience at this year’s Taste of Cape Town at the Green Point Cricket Oval from 19 – 22 April. This gourmet event allows the public to nibble their way around fourteen of the city’s top restaurants at each Taste session. The premise is quite simple: Cape Town’s finest chefs line up to showcase their culinary prowess with tantalizing signature dishes. All you have to do is hop from one to the other, sample the best cuisine the city has to offer, all while sipping on superb wines and cocktails. There are plenty of interactive food and liquor classes to attend and foodie folk to meet and greet. The Festival showcases fourteen of Cape Town’s top restaurants and chefs, who have been tasked to serve the fabulous trend-setting signature dishes that have made them famous. Back by popular demand, the Pick n Pay Fresh Living Chef’s Theatre will again host Cape Town’s top chefs in fun and informative cooking demonstrations, culinary challenges, entertaining tutorials. This year’s will also see the return of the Pick n Pay Wine and Canapé Experience, an interactive, hands-on area where guests will create three simple, stylish and utterly delicious canapés while an expert pairs each canapé with a wine to compliment the flavours. More foodie features include The Westin Executive Club Restaurant, The Snowflake Pancake Feature and The Amazing Thailand Experience. And don’t miss the DStv live Cook-Off in the Pick n Pay Fresh Living Chef’s Theatre on Saturday 21st April. Be sure to check out the Fine Brandy by Design by Distell, Jimmijagga, Jagermeister, Redds and San Pellegrino/Acqua Panna features, all of which will showcase the drinks that complete a meal - it’s not just about quenching those “thirst buds”, but also giving visitors the opportunity to mix and match flavours to get the best of every bite. Celebrate Cape Town’s local food heroes at The Small Producers Market where you will find delicious hand-made cheeses, pestos, homemade jams and sweets, as well as exotic ingredients and herbs to inspire home-chefs to create their own culinary masterpieces. Visit By Nature for dried fruit and nuts, Yummi Brownies for delicious chocolate brownies, or pick up a cupcake from Queen of Tarts! Visitors are invited to take a walk through the Taste & Buy Experience and discover a mouth-watering array of gourmet food suppliers and try delicious wines as well as speciality food and ingredients to take home such as Olive Pride, Three Streams Smokehouse, Sally Williams and Schecktersorganic Energy. For the little folk, Pick n Pay Taste of Cape Town in association with Orbit Chewing Gum has created a KidzZone hosted by Party Tots on Saturday 21st and Sunday 22nd of April. Fun activities for all ages are the order of the day which should keep the kids entertained while Mom and Dad enjoy the delectable delights the festival has to offer. 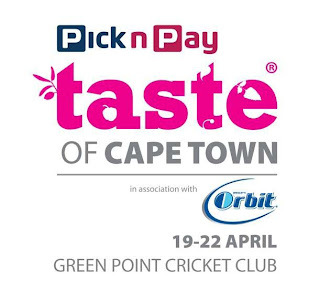 In addition to all of this, Taste 2012 is serving up a dose of Green Awareness, along with naming sponsors Pick n Pay and Orbit Sugar Free Chewing Gum, who both place great importance on environmental issues and actively promote and enforce sustainability in their core activities. The Pick n Pay Taste of Cape Town in association with Orbit Sugarfree Chewing Gum has also partnered with green companies such as Interwaste and Green Home in order to ensure a more sustainable event. The impressive list of participating restaurants, award-winning wineries, premium drinks brands and extraordinary exhibitors will guarantee that there will be something sensational for everyone. So get down to the Green Point Cricket Club from the 19th – 22nd April to enjoy one of South Africa’s most delectable Taste extravaganzas! Tickets are limited and booking is recommended – for further information and bookings visit www.tastefestivalssa.co.za or go to http://www.itickets.co.za/ or call 0861 000 291 for more info. A Taste Club House presented by DStv ticket costs R685 – includes fast-track entry, unlimited access to the Taste Club House which serves as your base for the show, R180 worth of Crowns (the official festival currency), 3 complimentary drinks, a crown bar facility and a free tasting glass. As part of the package, you can book an exclusive 30-minute wine tasting with the inimitable and highly respected Wade Bales. Well-known wine connoisseur, Wade, and a top SA wine maker will take you on a tantalising journey where you will get to sample a selection of iconic South African wines. Crowns are the Festivals’ official “currency”, which can be purchased at the festival from the Taste Bank or Crown Sellers walking around the festival grounds. Visitors use these Crowns to purchase food and drinks from the restaurants, bars and exhibitors. Each Crown is worth R5. Change is offered in Crowns only. Visit http://www.tastefestivalssa.co.za/ or purchase tickets from http://www.itickets.co.za/ or call 0861 000 291 for more info. Issued by Eddy Cassar Public Relations on behalf of Pick n Pay Taste of Cape Town in association with Orbit Sugarfree Chewing Gum. I went to this event last year and loved it!! There is a great selection of wine and food!! Loved the Limelight Chardonnay Pinot Noir 2011!!! At TASTE I tried De Wetshof wine. And I really liked the Chardonnay Pinot Noir 2011 at R35 a bottle. I bought one bottle while at the event, I drank it last night at a friend’s place, while we were having a Braai, and it was perfect for the occasion. I highly recommend this wine.